you with our expertise in robot technologies to make your research project a reality. We offer robust and long-living hardware. Thanks to their modular construction, our robots can be configured for all sorts of research topics, including navigation, human-machine-communication, interaction and manipulation. We can suit your needs! We are experienced in both practice and the field of robotic research and development. We ourselves have publications in the field and are always interested in conducting further research and in actively shaping the future of mobile service robots. Döring, N., Pöschl, S., Gross, H.-M., Bley, A., Martin, Ch., Böhme, H.-J. 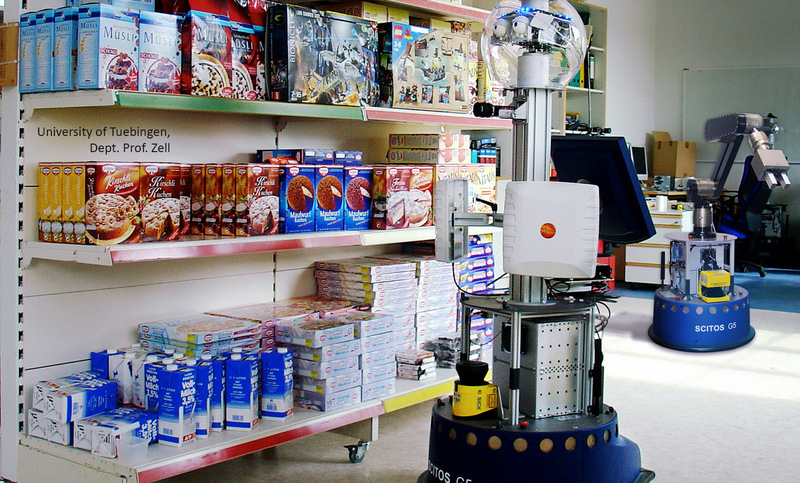 User-Centered Design and Evaluation of a Mobile Shopping Robot. Schröter, Ch., Müller, St., Volkhardt, M., Einhorn, E., Huijnen, C., van den Heuvel, H., van Berlo, A. , Bley, A., Gross, H.-M.
Realization and User Evaluation of a Companion Robot for People with Mild Cognitive Impairments. Einhorn, E., Langner, T., Stricker, R., Martin, Ch., Gross, H.-M.
MIRA – Middleware for Robotic Applications. Gross, H.-M., Schröter, Ch., Müller, St., Volkhardt, M., Einhorn, E., Bley, A., Langner, T., Merten, M., Huijnen, C., van den Heuvel, H., van Berlo, A. Further Progress towards a Home Robot Companion for People with Mild Cognitive Impairment. Merten, M., Bley, A., Schröter, Ch., Gross, H.-M.
A Mobile Robot Platform for Socially Assistive Home-care Applications. Pöschl, S., Döring, N., Gross, H.-M., Bley, A., Martin, Ch., Böhme, H.-J. Gross, H.-M., Schröter, Ch., Müller, St., Volkhardt, M., Einhorn, E., Bley, A., Martin, Ch., Langner, T., Merten, M.
Progress in Developing a Socially Assistive Mobile Home Robot Companion for the Elderly with Mild Cognitive Impairment. I’ll Keep an Eye on You: Home Robot Companion for Elderly People with Cognitive Impairment. Martin, Ch., Steege, F.-F., Gross, H.-M.
Estimation of Pointing Poses for Visually Instructing Mobile Robots under Real-World Conditions. Pöschl, S., Döring, N., Böhme, H.J., Martin, Ch. Mensch-Roboter-Interaktion im Baumarkt. Formative Evaluation eines mobilen Shopping-Roboters. Gross, H.-M., Böhme, H.-J., Schröter, Ch., Müller, St., König, A., Einhorn, E., Martin, Ch., Merten, M., Bley, A.
TOOMAS: Interactive Shopping Guide Robots in Everyday Use – Final Implementation and Experiences from Long-Term Field Trials. Stricker, R., Martin, Ch., Gross, H.-M.
Increasing the Robustness of 2D Active Appearance Models for Real-World Applications. Pöschl, S., Döring, N. Böhme, H.J. & Martin, Ch. Computergestützte Artikelsuche im Baumarkt – Formative Evaluation eines Artikelsuchsystems für mobile Shopping-Roboter. Gross, H.-M., Böhme, H.-J., Schröter, Ch., Müller, St., König, A., Martin, Ch., Merten, M., Bley, A.
ShopBot: Progress in Developing an Interactive Mobile Shopping Assistant for Everyday Use. Martin, Ch., Werner, U., Gross, H.-M.
A Real-time Facial Expression Recognition System based on Active Appearance Models using Gray Images and Edge Images. Richarz, J., Scheidig, A., Martin, Ch., Müller, St., Gross, H.-M.
Martin, Ch., Schaffernicht, E., Scheidig, A., Gross, H.-M.
Multi-Modal Sensor Fusion Using a Probabilistic Aggregation Scheme for People Detection and Tracking. Thrun, S., Martin, Ch., Yufeng Liu, Hähnel, D., Emery-Montemerlo, R., Chakrabarti, D. and Burgard, W.